A variety of different topics are taught through the 'Come and See' RE programme. The programme of study, written by a group of experienced diocesan advisors, was introduced across the school in January 2014 and has been warmly received by staff and pupils. The child friendly material provided within Come and See allows children to explore the teachings of the Catholic Church through the use of age appropriate resources and activities. At the heart of the programme is the mystery of God’s self-revelation of love through Jesus Christ. Come and See gives pupils the opportunity to explore the mystery of faith through Scripture and Tradition. 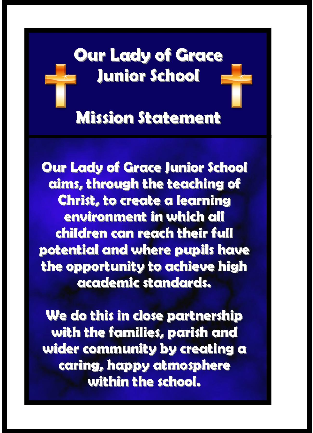 Religious Education continues to be of the highest priority in this school as we seek to improve its delivery and implement the Curriculum Directory. RE wall displays created by the children.